Change is inevitable in business. The ability to manage change ensures the success of your team during difficult transitions and helps team members adjust and remain productive. But how do you keep your team members focused on performance amidst the distractions of complex change initiatives? As a manager and team leader, you must effectively handle the emotions, fear, and anxiety that accompany change and encourage your team members to support new initiatives. Understanding the three phases of change—resistance, exploration, and acceptance—will allow you to more clearly communicate transformations and help your team members embrace change. 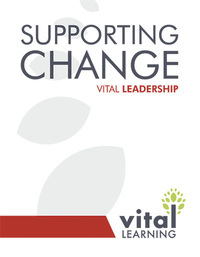 The Vital Learning Supporting Change™ course equips managers and team leaders with the tools to understand and interpret change so they can more successfully guide their teams through it. By working to support change while addressing the team’s comfort level with it, managers and team leaders will more effectively facilitate acceptance of new processes and procedures. 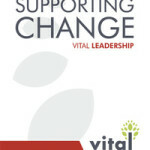 Click the “e” to immediately enroll and begin the Supporting Change online course.